Suheil Baddor's U.S. visit is co-sponsored by The Kimmel Harding Nelson Center for the Arts and Creighton University's Center for Asian Studies. Suheil will exhibit his artwork, photos of which may be seen at www.baddor.com, hold an extended workshop, and be a guest lecturer at Creighton University, Omaha, Nebraska during the weeks following his stay in Nebraska City. 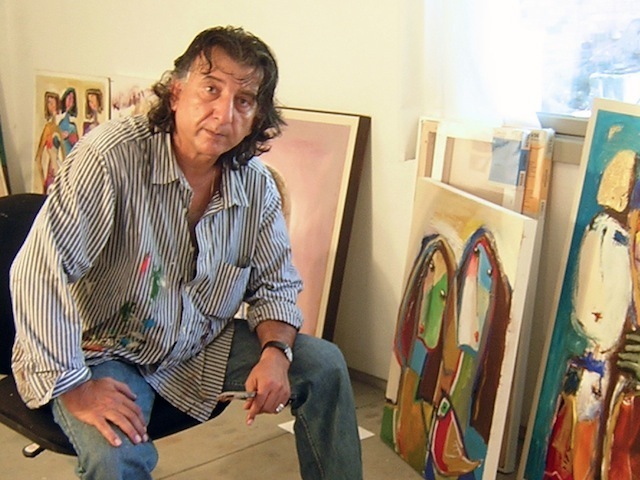 A master of art and Arabic literature in the Syrian tradition, Suheil Baddor has created over five thousand works of art during his thirty-five year professional career. His art has been featured in over thirty-five solo exhibitions and at least twice as many group exhibitions, including four times in the Sharjah Biennial and every year since 1985 in the annual Syrian professional artist exhibition. His creations include characterizations on stage and screen, and original Arabic poems and short stories, but he is best known for his sculptures and paintings in acrylic, oil and watercolor. His sculptures in wood, bronze, granite and marble have been recognized as major contributions to the field of sculpture. Suheil has been the subject of and has contributed to numerous art and culture commentaries in the Arabic press.